Some people believe that black is beauty while fair colour only attracts. 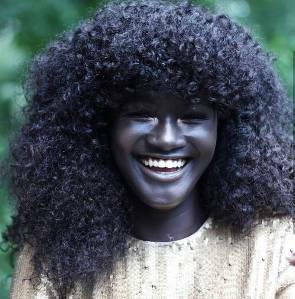 Could you say that to this young Senegalese, Khoudia Diop who happens to be a model with an extremely dark skin that can be likened to that of Charcoal? Diop has received a lot of attention including write-ups in Bossip and African Celebs because of her stunning features and outstanding dark skin.